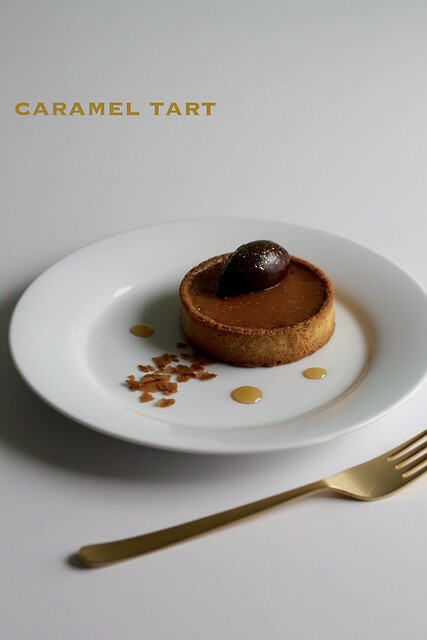 This looks like a pumpkin pie, and given this time of year that would be a logical assumption, but it is in fact a Caramel Tart. I was expecting something super sweet, chewy and gooey but was surprised. It really isn’t overly sweet, has more the consistency of a ganache tart and really is fabulous cold, as Dorie recommends. I made just two individual tartelettes, using a quarter of a recipe, but if I have a dinner party, I won’t hesitate to make a big one. I put a quenelle of ganache top (more for photo decoration than anything else) and when we ate them, a bit of whipped cream, too…delicious. When i posted my pic on FB, my mom thought it was Pumpkin, too, untill she read the description and died a little that she couldn’t have any. Lol. I also did some whipped cream, which i thought was the perfect foil for this tatrt. Oooh, what perrrrrfect plating! Just gorg! Good idea with the toppings. This month the desserts were beige and not very photogenic. Hope you had a wonderful Thanksgiving. I love the addition of ganache on top – caramel and chocolate together, what could be better!